To non-bloggers, the world of blogging is completely foreign. Then trying to explain that there is money to be made by blogging can be even more confusing. There is so much involved when it comes to creating sponsored content (paid posts) that I want to break it down a bit for the readers. The Pitch. It all starts with a pitch. The pitch is the foundation to all sponsored content. It creates a general foundation of what you can do, how you can help promote the brand/product, and how it might benefit your audience. Think of this like a resume for a job you are applying for. These pitches could be used when applying for campaigns through an agency or they could be emailed directly to the brand. 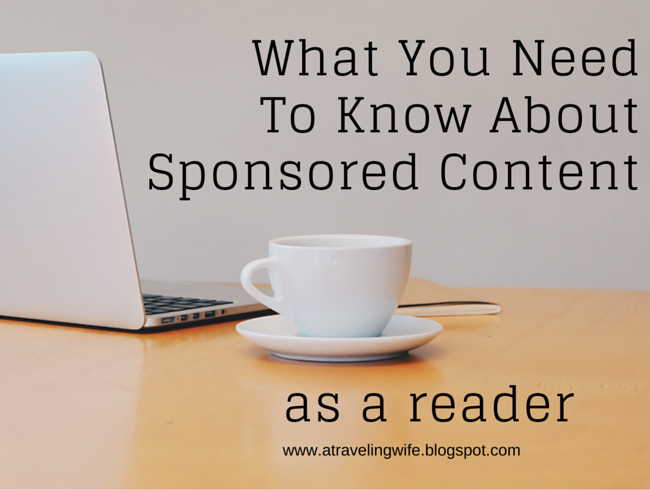 Click to tweet: What you need to know about sponsored content as a reader. The Disclosure. The FTC has endorsement guidelines and bloggers are not exempt from this. We are required to inform our audience when a product is given to us for review or when payment is received for a post. Any time product, service, or payment is exchanged, we must tell our readers and it must be done before the mention of that product or service. You might be familiar with canned statements near the top of a post and you might be confused why a handful of bloggers are using the same statement. This could be required for that particular campaign - we post it because we have to. Just know that these disclosures are included for any and all endorsements so we are not misleading you as a reader. What you read is only part of the work. The content you read in a sponsored post is only a portion of the work. Notice the photography and links - these all take time, lots of time. The photography needs to be staged for aesthetics and taken in good lighting. Think, for every post that contains 5 photos, there are dozens of other photos that were edited out. I typically take 50-80 photos to get 3-5 great shots that are blog worthy. Don't get me wrong, there are some people that can get the perfect shot the first time, but most bloggers want options. Also, specific links need to be included based on the campaign guidelines. These required links that direct you to a specific page must be coded to instruct some search engines that the hyperlink should not influence ranking. I could create a whole post talking about nofollow links. This is just a portion of a behind-the-scenes for sponsored content. If you are interested in reading about sponsored content from the bloggers point of view, What You Need To Know About Sponsored Content - For Bloggers is for you. Are there any specific questions you have regarding sponsored content? Have you ever been able to capture a perfect photo on the first shot?